The flag of French Guiana can be described as follows: A logo of a yellow five-pointed star in a patch of blue is placed over an orange figure in a yellow boat, which in turn is on a patch of green over two wavy orange lines. There is a white field behind the logo, while the words GUYANE and LA REGION appear below. However any discussion about the flag of French Guiana can be confusing since the region, located on the north Atlantic coast of South America, is actually associated with three different flags! First there is the regional flag, as depicted above. Then there is the national flag, which is official tri-color flag of France (with one stripe of red, white, and blue). Finally, there is the flag of French Guiana which was adopted by the departmental council however not recognized by the regional council. 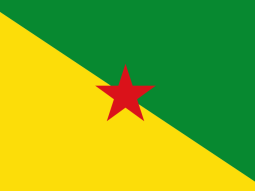 The latter consists of a red star said to represent socialism, green to represent the forest, and yellow to represent gold and other minerals found in the region. What most people don't know is that the mainland of France is divided into 22 regions, each with their own historical flag in additional to the French national flag. For example, there is a unique flag of Brittany, of Corsica, of French Polynesia, of Guadeloupe, and many more. French Guiana, however, is counted as one of the four overseas regions of France, along with Guadeloupe, Martinique, and Reunion. In colonial times, there were five "Guiana" colonies: Spanish Guiana, British Guiana, French Guiana, Dutch Guiana, and Portuguese Guiana, most of which are known by other names now. If you look for French Guiana on a map, you will see that it shares borders with Brazil to the east and Surname to the west. It has a small population, about 230,000, most of who live in the capital city of Cayenne. 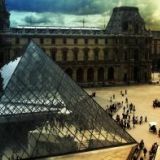 The primary language spoken is French however other local languages include French Guiana Creole, Portuguese, Haitian Creole, Spanish, Dutch, and English. One place you can see the flag of French Guiana displayed is at the Guiana Space Center, the construction of which was initiated by French President Charles de Gaulle in 1964 to promote economic growth in the area. In recent years, rocket launchers such as the Ariane 5 and Ariane 4 have made headlines in the European space industry. And while the head of government is none other than the prime minister of France, a prefect is appointed to head the local French Guiana government. In turn, French Guiana sends two senators to the French Senate and two deputies to sit with the French National Assembly. You might be wondering: Since there is an independent flag of French Guiana, why has there not been a move for independence by the region? 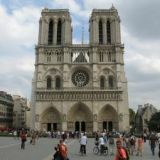 The truth is that during the 1970s and 1980s there was a movement pushing for increased autonomy from France; however that momentum has since died down.